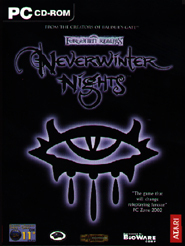 'Neverwinter Nights (NWN) is a new Advanced Dungeons & Dragons (AD&D) roleplaying game from BioWare, the developers of Baldur's Gate and Tales of the Sword Coast. Neverwinter Nights has been designed specifically for the online, multiplayer environment and the latest in 3D technology and also allows you to experience all the magic of pen-and-paper Dungeon-Mastering on your home computer! Using Neverwinter Nights' powerful and user-friendly Solstice Toolset, you can create and populate entire new modular worlds and stories for others to adventure in. As an all-powerful Dungeon Master (DM), Neverwinter Nights even allows you to alter the plot, possess characters, and manage combat from behind the scenes, all in real-time. Visit the official Neverwinter Nights website!